Access to public education should be available to all children, regardless of where they were born. This seems like a simple idea – why would we deny any child a basic K-12 education? How can a child grow intellectually and emotionally, and become a contributing member of society, without a sound basic education? Courts and legislatures have recognized that fact for years, particularly in Brown v. Board of Education. Because of education’s importance, North Carolina makes a broad promise of public education for students. Yet some immigrant children in North Carolina are kept out of schools because of their limited English or national origin. SCSJ, along with three other legal services organizations (Legal Services of the Southern Piedmont, The North Carolina Justice Center, and the Southern Poverty Law Center) recently filed a complaint with the U.S. Department of Justice demanding that all NC children have access to public schools, regardless of their immigration status or country of origin. According to North Carolina statute, any child living within a county has the right to attend public school within that county. This state-level protection and the Equal Protection Clause of the United States Constitution collectively make a promise that all children – regardless of immigration status – may enroll in their local public school. Yet the children represented in the complaint were turned away from public schools in various counties in North Carolina. Two were told that they were too old to enroll in high school even though they were 17 and NC public schools allow students up to age 21 to attend high school. One was told that he must pass an English-language proficiency test before being enrolled. Requiring a child to speak English before he has a chance to learn it is deeply perverse. It is also illegal. The discrimination encountered by these children is a violation of Title IV and Title VI of the Civil Rights Act of 1964, which bars discrimination on the basis of national origin in federally funded public schools, according to the complaint. The complaint also notes that more than 30 years ago, the U.S. Supreme Court held in Plyler v. Doe that it is unconstitutional to deny a child present in the United States a public education on the basis of her federal immigration status. 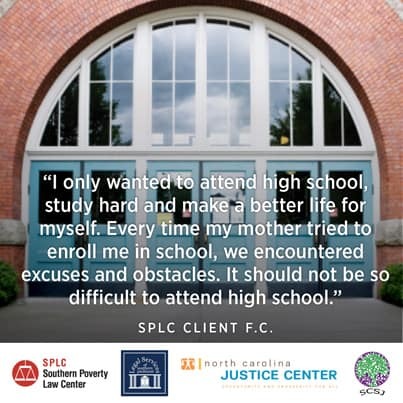 SCSJ believes that every child deserves access to public education. Participating in this federal complaint is part of our commitment to provide education access for all children in North Carolina. The press release is available in English and Spanish. The full complaint with all attachments is available in English and Spanish .